Up until the mid-1950s, there was a degree of separation between illustrated educational books and illustrated picturebooks. That all changed, dramatically and with much national fanfare, with the 1957 publication of Dr. Seuss’s The Cat In The Hat (Random House). Here was an early reader, full of 220 madly rhyming words, which made its way into our elementary school classrooms. The Cat In The Hat is a tremendously important book. Not just an important picturebook or an important children’s book, but an important book without any qualifiers! The publication of the book in 1957 forever changed the way in which children would learn to read and be educated. Reading COULD be fun! The following table is an excerpt from the Children’s Picturebook Price Guide. The estimated values are for first edition books, with dust jackets. The Children’s Picturebook Price Guide explains in understandable terms the methods to correctly identify first edition Dr. Seuss books. 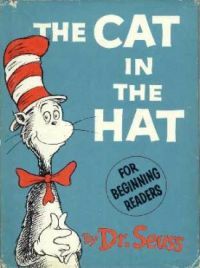 The Cat In The Hat was published by Random House. However because of it’s success, an independent publishing company was formed, called Beginner Books. Theodor Seuss Geisel, aka Dr. Seuss, was the president and editor. Springing from this series of beginning readers were such standards as A Fly Went By (1958), Sam and the Firefly (1958), Green Eggs and Ham (1960), Go, Dog. Go! (1961), Hop On Pop (1963), and Fox in Socks (1965), each a monument in the picturebook industry, and also significant in the historical development of early readers. All are still in print and remain very popular over forty years after their initial publication. Creators in the Beginner Book series were such luminaries as Jan & Stan Berenstain, P. D. Eastman, Roy McKie, and Helen Palmer (Mr. Geisel’s wife). The Beginner Books dominated the children’s picturebook market of the 1960’s, and still plays a significant role today within the phases of students’ reading development. Prior to the publication of his first children’s book in 1937, And To Think That I Saw It On Mulberry Street (Vanguard Press, 1937)), Theodor Seuss Geisel was a prominent and successful humorist illustrator for such magazines as Judge and Life. 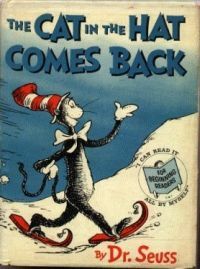 By the time of The Cat In The Hat’s publication, Dr. Seuss was a very successful children’s book illustrator, having published twelve children’s books, three of which had won Caldecott Honor awards. Actually, prior to the publication of The Cat In The Hat, one could easily say that Dr. Seuss had already had two successful illustration careers, one as a humorist and one as a picturebook creator. In the classroom boys and girls are confronted with books that have insipid illustrations depicting the slicked-up lives of other children. [Existing primers] feature abnormally courteous, unnaturally clean boys and girls.” “In bookstores, anyone can buy brighter, livelier books featuring strange and wonderful animals and children who behave naturally, i.e., sometimes misbehave. Given incentive from school boards, publishers could do as well with primers. Why should [school primers] not have pictures that widen rather than narrow the associative richness the children give to the words they illustrate—drawings like those of the wonderfully imaginative geniuses among children’s illustrators, Tenniel, Howard Pyle, “Dr. Seuss,” Walt Disney? Geisel responded to this “challenge” by rigidly limiting himself to a small set of words from an elementary school vocabulary list, then crafted a story based upon two randomly selected words—cat and hat. The results of this personal challenge are nothing short of amazing! Successful before the publication of the The Cat In The Hat, after it’s publication, Dr. Seuss became an ‘overnight’ national phenomenon. 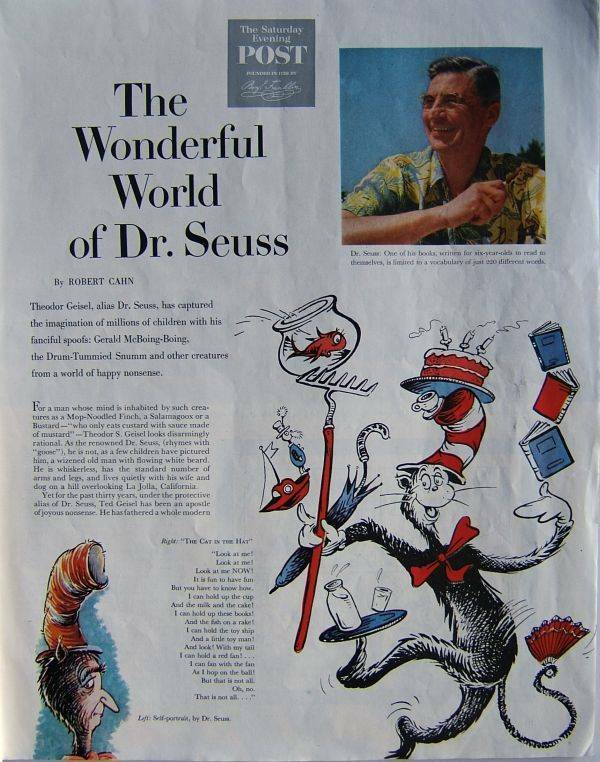 After the publication of The Cat In The Hat, numerous feature articles were published in Life, Look and other prominent periodicals. The book’s characters, along with other Seuss creations, were extended into toys and other products, occurring long before co-merchandising and line extensions became commonplace for children’s character marketing. B-10 1959 Stop That Ball! B-18 1960 Are You My Mother? B-19 1961 Ten Apples Up On Top! B-20 1961 Go, Dog. Go! B-31 1963 Do You Know What I’m Going To Do Next Saturday? First printings of the each of Beginner Books published from 1957-to-1973 should be considered by children’s book collectors. Many collectors are on the lookout for the Dr. Seuss books, however there has not been as keen an interest in the non-Seuss Beginner Books. The non-Seuss books are relatively inexpensive in the market place, however locating first printings is difficult. Part of the difficulty is due to the uncertainty in the industry in identifying true first printings of the early Beginner Books. We are in the process of publishing identification information on our website, which will help to rectify this ongoing issue. In 2001 Publisher’s Weekly created their lists of the All-Time Bestselling Children’s Books, for both hardcover and paperback books. We consider copies sold one of the key factors in the collectibility of a children’s book (when the initial printing is low relative to the eventual copies sold). Twenty of the Beginner Books made the list, with eleven in the All-Time Bestselling top 50. Several of the Beginner Books are from the ‘Bright and Early’ sub-series which was started in 1967. The first twelve Beginner Books were published between 1957-to-1959 and should be on your ‘watch for’ list. First editions are easily identifiable, as all but Cat In The Hat state ‘First Printing’ on the copyright page. We’ve documented first edition identification points for Cat In The Hat on our blog. Another key book in the series is Helen Palmer’s A Fish Out of Water, illustrated by P.D. Eastman. Palmer was Geisel’s wife, and wrote several of the early Beginner Books. However we think Dr.Seuss should be given co-authorship as we wrote in an article A Story Of Two Fish: Dr. Seuss Out Of Water, comparing A Fish Out Of Water to Seuss’s Gustav The Goldfish. Within the hobby, to our knowledge, a method for identifying first printings of Beginner Books has not yet been published. Soon we hope to resolve this absence.